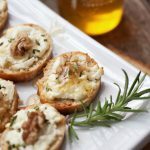 These Quick and Easy Puff Pastry Appetizers make use of store-bought, all-butter puff pastry, to make 3 varieties of delicious appetizers, perfect for your holiday entertaining! When it comes to holiday entertaining, store-bought puff pastry is such a life (and time!) saver. Not only is it easy to use, it is also so versatile. And now with all-butter varieties easily available, it’s delicious too! One of the best things about these quick and easy puff pastry appetizers, is that they can be prepared ahead and frozen before baking. When you need a quick appetizer, they can go straight from the freezer to the oven and be ready to serve in about 20 minutes. I spent an afternoon recently making up a few varieties of appetizers to stock my freezer for the holidays. I made Gruyere and Mustard Puff Pastry Sticks, Pesto and Sundried Tomato Puff Pastry Twists and Cheddar and Chipotle Puff Pastry Cut-outs. Top Tip! When it comes to puff pastry, it’s all about the chill, particularly with all-butter puff pastry. You want to keep the dough cool, so in between steps you’ll be popping it in the fridge. 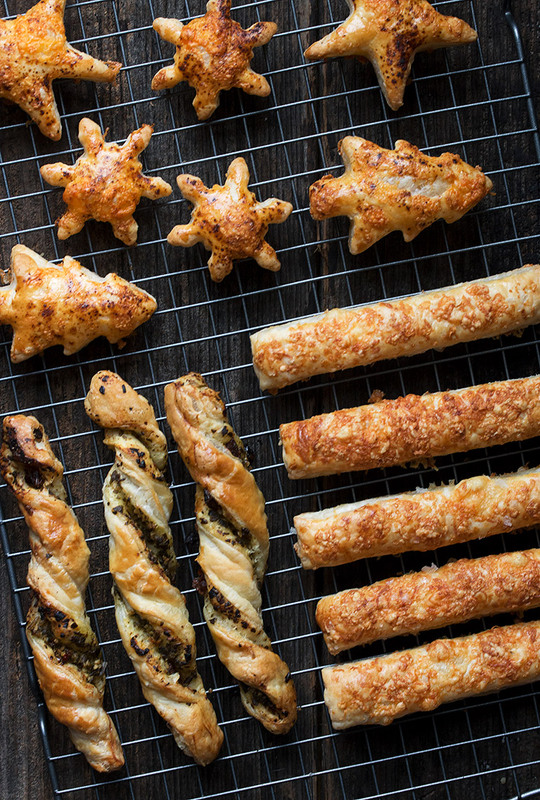 It’s a bit repetitive, but if you’re making a variety of puff pastry appetizers, you can use the chilling time to get started on the next one. I love Dijon mustard, but if you’re not a fan or you feel it might be too assertive for the crowd you’re feeding, feel free to cut back the amount or to substitute honey mustard or a similar, milder mustard. The cut-outs are super easy to make and tasty little bites. They are a great addition to a cheese tray, beyond just eating out of hand. Adjust the amount of chipotle chili powder to taste. Your brand of puff pastry may be a slightly different size. The directions should work well with any similar size. You may just get an extra piece or two. 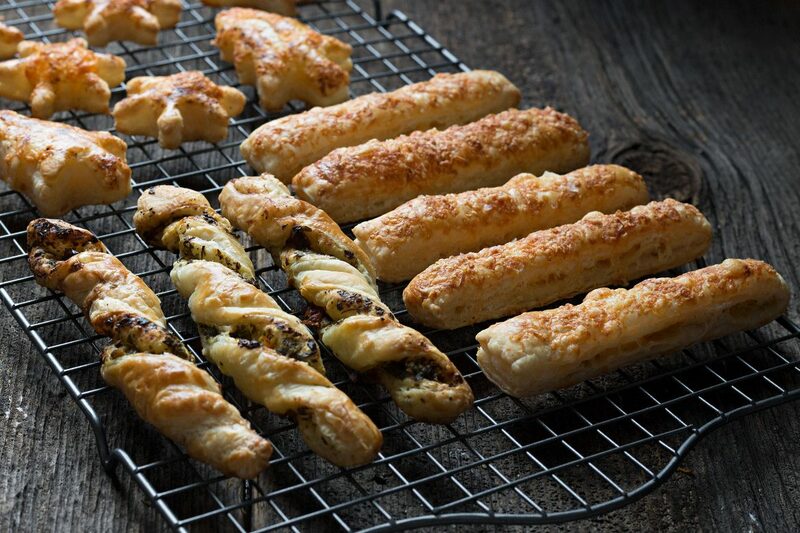 The Gruyere and Mustard Puff Pastry Sticks were adapted from an Ina Garten recipe. 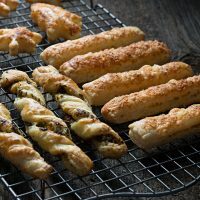 Three varieties of quick and easy puff pastry appetizers, all starting with store-bought, all-butter puff pastry sheets. Gruyere and Dijon Sticks, Pesto and Sundried Tomato Twists and Cheddar and Chipotle Cut-outs. Can be made ahead and frozen before baking, then baked off from frozen as needed. For the Gruyere and Mustard Puff Pastry Sticks: Place the thawed square of puff pastry on a lightly floured cutting board. Spread the Dijon mustard on the lower half of the square, leaving about 1/2 inch uncovered along the edges. Brush the exposed edges with egg wash. Fold the bare top half of the puff pastry over the half with the mustard, lining up the edges. Place in the refrigerator (still on the cutting board) to chill for 15 minutes. Remove from fridge. With a sharp knife or pizza cutter, trim the two short sides and un-folded long edge by about 1/4 inch. Cut the block in to nine 1-inch by 5-inch slices. Remove the slices to a parchment lined baking sheet, leaving at least an inch in between each piece. Carefully brush the tops with egg wash, ensuring that egg doesn't drip down the sides. Sprinkle Gruyere and Parmesan evenly over-top, the finish with a sprinkling of coarse salt. Place the baking sheet in the refrigerator to chill for 15 minutes. Preheat oven to 400F. Remove baking sheet from refrigerator and place into preheated oven. Bake for 15-18 minutes, or until golden and puffed. Remove to a baking sheet to cool. For the Pesto and Sun-Dried Tomato Puff Pastry Twists: Place the thawed square of puff pastry on a lightly floured cutting board. Spread the pesto on the lower half of the square, leaving about 1/2 inch uncovered along the edges. Sprinkle the chopped sundried tomatoes over-top. Brush the exposed edges with egg wash. Fold the bare top half of the puff pastry over the half with the pesto, lining up the edges. Place in the refrigerator (still on the cutting board) to chill for 15 minutes. Remove from fridge. With a sharp knife or pizza cutter, trim the two short sides and un-folded long edge by about 1/4 inch. Cut the block in to nine 1-inch by 5-inch slices. Take each slice and holding the ends, gently twist several times. Remove the twisted pieces to a parchment lined baking sheet, leaving at least an inch in between each piece. Carefully brush the tops with egg wash. Place the baking sheet in the refrigerator to chill for 15 minutes. For the Cheddar and Chipotle Puff Pastry Cut-outs: Place the thawed square of puff pastry on a lightly floured cutting board. Brush bottom half of square with egg wash. Fold bare top half over the brushed half, lining up the edges. Place in the refrigerator (still on the cutting board) to chill for 15 minutes. Remove from the refrigerator. Using a cookie cutter, cut shapes from the piece of puff pastry. Place on to a parchment-lined baking sheet, allowing at least 1-inch between pieces. Carefully brush tops with egg wash, ensuring that the egg doesn't drip down the sides. Sprinkle tops with grated cheddar, then dust with a bit of chipotle chili powder (to taste). Place the baking sheet in the refrigerator to chill for 15 minutes. Preheat oven to 400F. Remove baking sheet from refrigerator and place into preheated oven. Bake for 10-12 minutes, or until golden and puffed. Remove to a baking sheet to cool. Cooled pastries can be stored in an airtight container at room temperature for up to 24 hours. You can re-warm on a baking sheet in a 350 oven for a few minutes. Notes: To make ahead and freeze, instead of placing in the fridge for the chill before baking, place the baking sheet in the freezer with the pieces on the baking sheet. Leave in freezer for 30-45 minutes, or until frozen, then carefully remove to a freezer bag to freeze. To use, simply place frozen pieces on a parchment lined baking sheet and bake in 400F oven for the prescribed recipe time, plus a few minutes longer as they are starting from frozen. These are quick, easy and delicious. Nice any time of year, but especially nice for the holidays! 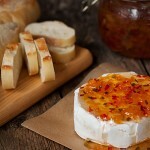 Perfect on top of warm brie! And because it's made with dried apricots, you can make this any time of year. 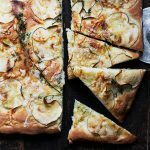 This one is so easy and delicious and absolutely perfect with a glass of wine. 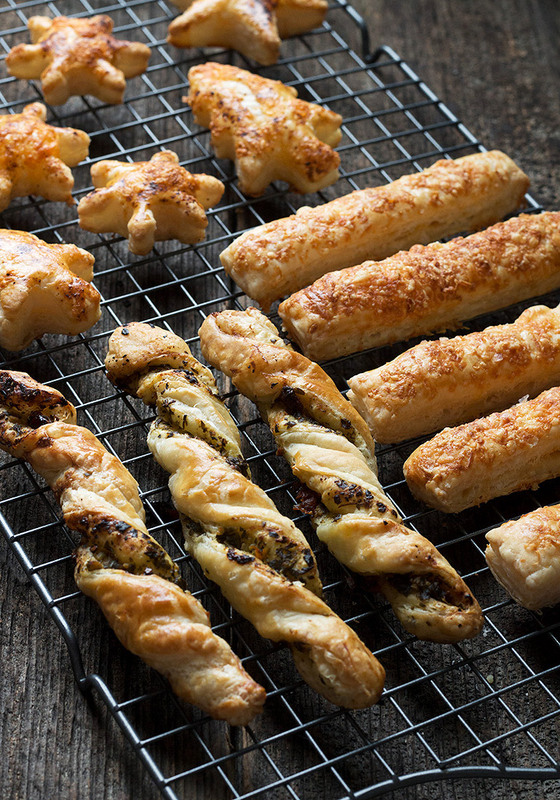 Puff pastry bites are always such a crowd pleaser – these look irresistible! 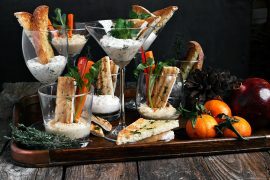 I love that you can freeze these appetizers so holiday entertaining just got easier. That mustard and cheese version is really calling my name! I seriously LOVE all things involving puff pastry! It’s just so buttery, flakey and delish!! Needless to say ALL of these look and sound amazing! Is it weird I just want these for dinner?! ;) Cheers! Puff pastry is so fancy and beautiful! 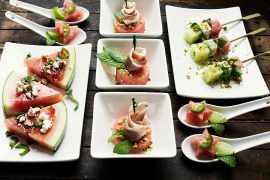 These appetizers will make any guest feel special! Hi Jennifer, any ideas for using puff pastry without cheese stuffings? Hi Elaine. Are you avoiding all dairy or just cheese? My first thoughts are things like mushrooms or roasted red pepper. Or straight up sun dried tomato. The mustard one would be good without the cheese on top too, I think. These are beautiful and look like they come from some fine pastry shop, Jennifer! I love all your variations too! Love these and all the three flavor options Jennifer! 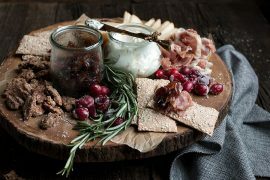 So perfect for holiday entertaining! Nothing beats puff pastry!